Hi Everyone! 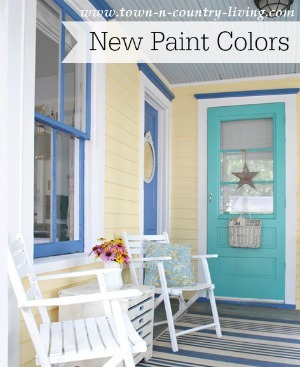 This is Jennifer Zuri from Town and Country Living. 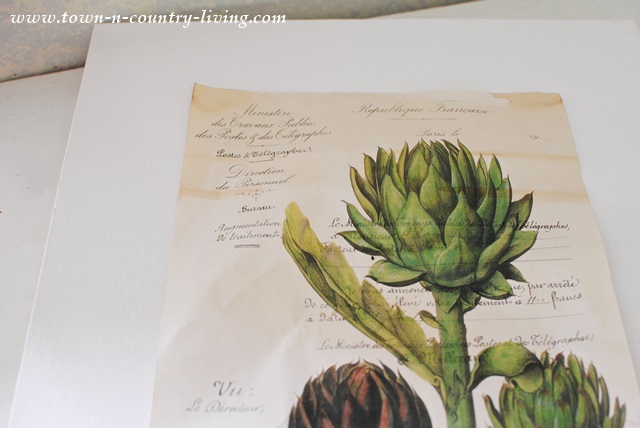 Today I’m sharing an easy DIY botanical art project. 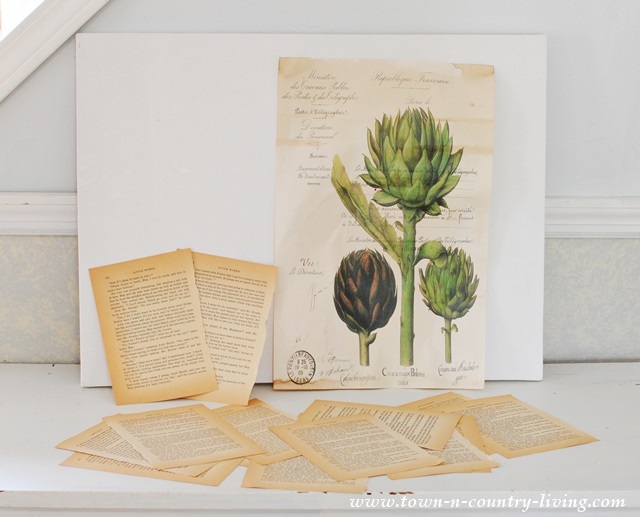 Earlier this month at our local flea market I ran across this beautiful botanic artichoke print and was inspired to turn it into an art project. Here’s my finished art project, a botanic print framed in book pages. 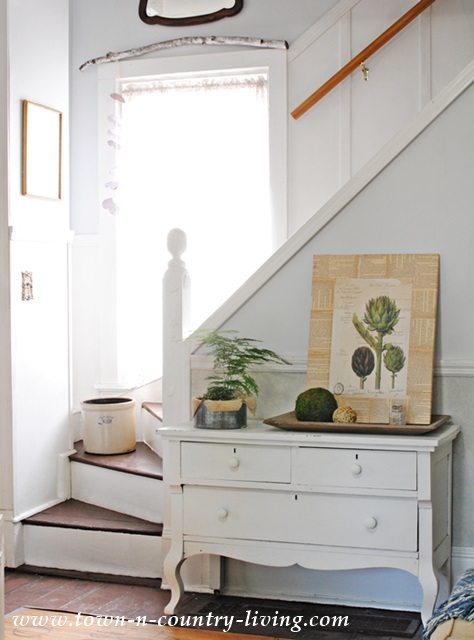 I love botanic prints and I love artichokes! 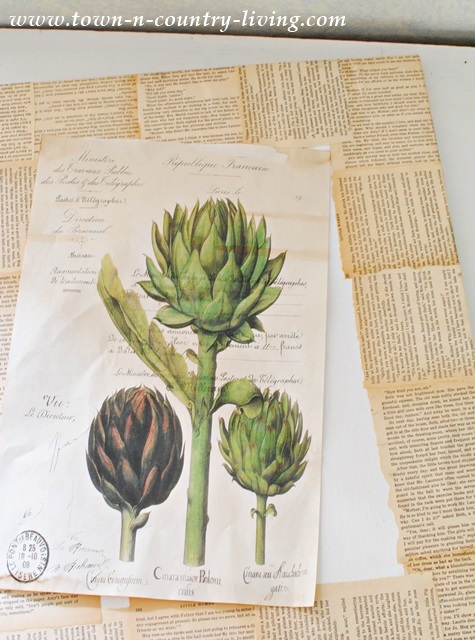 Only a few supplies are needed for this DIY botanical art project. 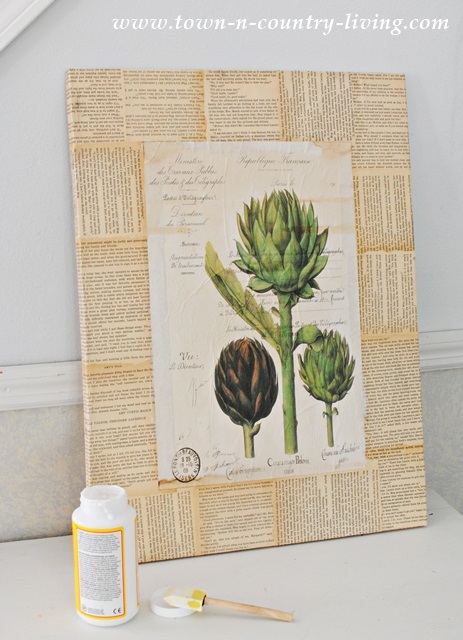 An art canvas, a botanic print, book pages, and a little Mod Podge. First, center your print on the canvas to determine space needed to fill with book pages. 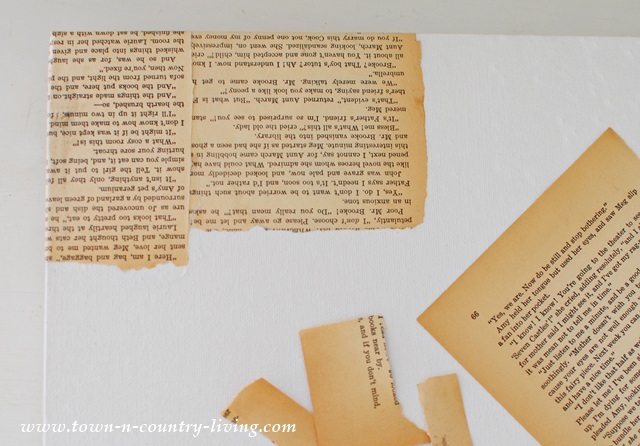 Start ripping the edges off of the book pages so you have jagged edges. 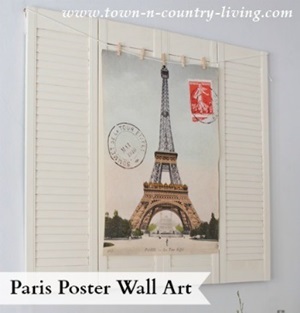 Apply Mod Podge to canvas and apply pages, wrapping them around the edge of the canvas. Use your fingers to carefully smooth the pages down. It doesn’t have to be perfect. Apply the book pages around the perimeter of the canvas. As you work, wash your fingers off from time to time. You’ll get ink from the pages on your fingers and don’t want smudge marks. Next you’ll need to center the botanic print on the canvas. I measured from the edges and lightly marked the corner positions with pencil. 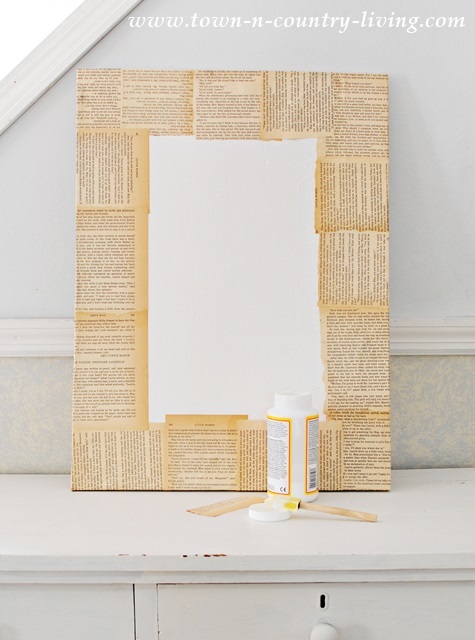 Working quickly, apply Mod Podge to the canvas and atop the edges of the book pages. 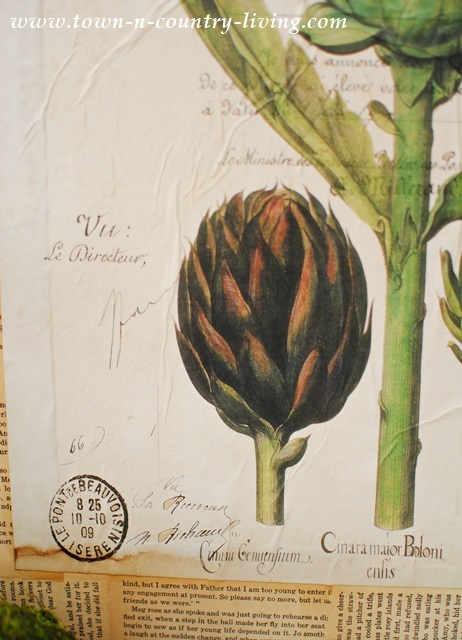 You’ll want to apply the glue in the area where you’re placing the botanic print. Carefully place your print and then smooth with your fingers. Creases are okay! They will give your artwork more of an aged look. 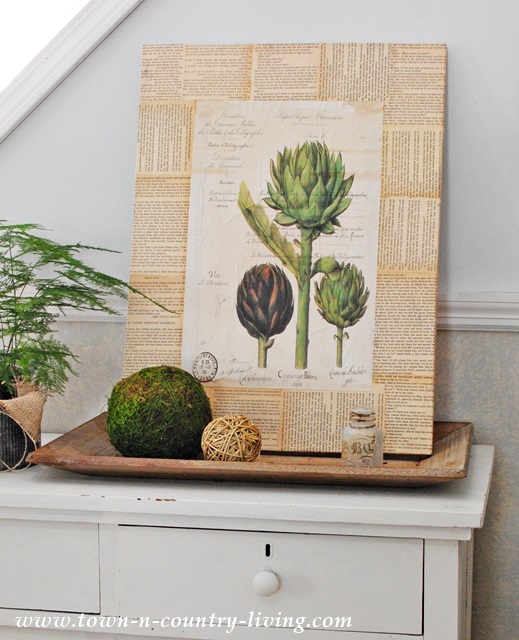 Rather than hang my DIY botanic art print on the wall, I set it in a rustic wooden tray. A large moss ball, a twig ball, and an altered bottle finish the vignette. I like to rearrange artwork in the house to give it a fresh look. You could use any kind of print or poster to create your own DIY art project using canvas. Let your imagination run free and see what you can create! 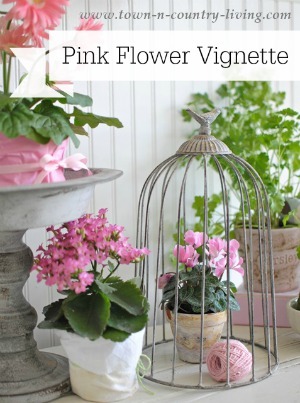 Visit my blog over at Town and Country Living. Or you can follow me via the social sites below! It’s beautiful, Jennifer! I love the print; such a great find. I love the idea of using the book pages. I have some plaque pictures from the dollar store that would make a great base. I’ve used them with some vintage images from The Graphics Fairy and scrapbook paper in the past. I need to see what I’ve got in book pages now! Great idea . . . I really liked! Great art project! I love how you have displayed it!